If you happened to read our piece on how to best deal with fights while traveling as a couple then you’re already aware of the importance we place on personal time while traveling as a couple. It really doesn’t matter how much you love your significant other, how much you enjoy spending every day with him or her, or how important it is to you that you experience things together. It is absolutely imperative to make time for yourself while you’re traveling with your significant other. 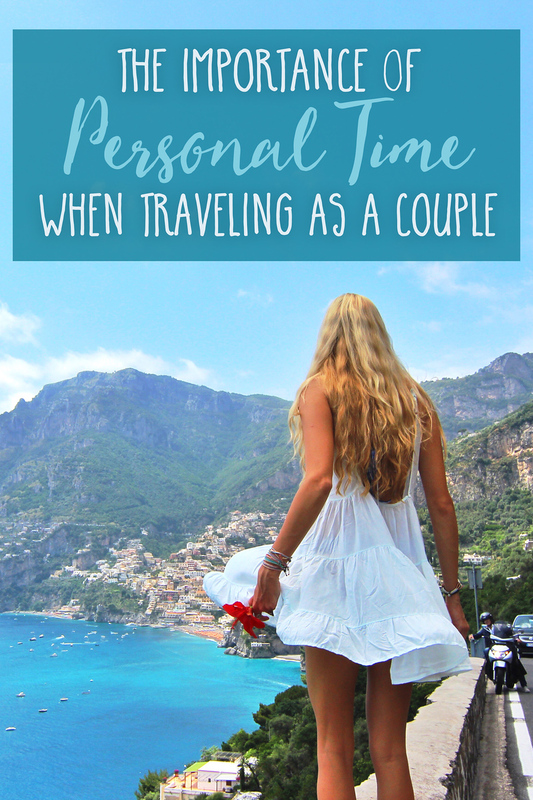 So here’s why personal time is so important when traveling as a couple! When you spend too much time together fights seem to almost create themselves. It is simply unhealthy to spend every moment together. Make time for yourself. If you love playing or watching sports, don’t let the fact that you’re traveling, in a relationship, or both, allow you to quit something that you love doing. Or let’s say you love shopping or getting a pedicure with friends- continue to make time for that. Even if you’re in a foreign land where you can only find some derivative of your hobby. Go have fun! The stronger you are individually, the stronger you will be in the relationship. Two successful people who both make each other better people make the best couples. And guess what? Those couples spend plenty of time apart whether it is alone or with friends. Personal time isn’t just something you should do at home. We promise, the same rules will apply to your relationship while you’re traveling which means you ought to keep up the healthy aspects – i.e. making room for personal time. It’s really nice to miss your significant other and to feel missed. Seeing your lover after a day (or even just a few hours) apart is always so refreshing. The longest trip we’ve taken together was 5 days. I think we were just so excited to be in Montreal (we had been talking about this trip for a few years) that we didn’t notice we were slowly starting to irritate one another. Nothing huge, but the little things of being with someone 24/7. I realized towards the end how much I was missing that recharge time. Great advice! Soooooooo very important! (yet hard for people to say!) When me and my boyfriend travel we absolutely have to do this (and even at home!! haha). We always want to respect each other as individuals so we always have a few separate activities to spend a little time by ourselves. A lot of the time, the photoshoots I book while traveling help give us time apart but we will also schedule it in here and there.